The BPAN project has produced recommendations for strengthening the protected area network in the Barents Region. The recommendations are based on wide analyzes of harmonized natural and anthropogenic data covering the whole region and evaluations of the protected area system with help of the CBD Programme of Work on Protected Areas (PoWPA). The main target group of the recommendations are decision makers and nature conservation authorities. • Results of national and regional gap analyses on high conservation value areas and representativeness of the protected area network should be taken into consideration. Representativeness of the protected area network should be assured through the establishment of protected areas in under-represented habitats and ecosystems. • There is a need for prompt establishment of planned protected areas as statutory protected areas by 2020. • In particular, large intact areas need to be prioritised for protection as they are crucial in maintaining ecological processes and ecosystem functions, and are under pressure from intensified land use. • Protection of productive old-growth forests and larger intact forest landscapes should have high priority. • High conservation value areas, identified in the Gap analysis of northwest Russia, need to be protected. 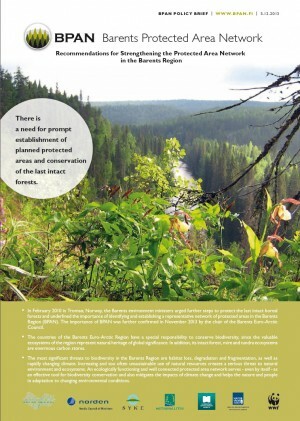 Information on high conservation value areas of the whole Barents Region should be compiled. • A comprehensive assessment of the connectivity of protected area systems is needed. • The Barents Region has a few principal ecological corridors of relatively intact ecosystems, which have special importance for biodiversity. Conservation of these corridors should get special attention. • Development of the road network needs better spatial planning and environmental impact assessment. Protected areas, planned protected areas and other high conservation value areas need to be taken into consideration. • Improved and more appropriate regulations, particularly for regional protected areas in northwest Russia, need to be taken into consideration. • There is a need to develop and update management plans and monitoring schemes for protected areas. • More comprehensive assessment of management effectiveness is needed. • More work should be done to involve local communities, indigenous peoples and other stakeholders in protected area planning and management. It is very important that they are committed to the protected areas. • Financing of protection, implementation of protected area plans, programmes and management actions varies in the Barents Region, but in general it is insufficient. • The largest planned protected areas with intact forests of international significance are located in northwest Russia. Therefore it is important that Russian regional authorities are provided with sufficient, long-term resources to ensure establishment of statutory protected areas. • Co-operation in the BPAN project has been successful and should be further strengthened for the second stage of the BPAN project.